There aren’t many stories that merit three remakes but A Star is Born might just be one. A tale of fame, addiction, creativity, and more, it certainly chimes with our celebrity-obsessed times. 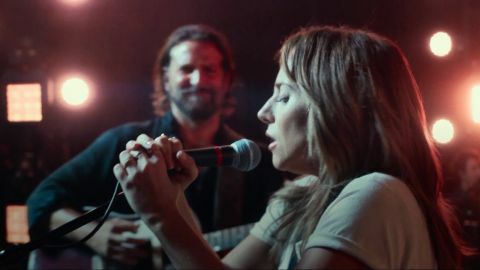 And there probably isn’t a better casting choice than Lady Gaga to play Ally, a waitress who rises to fame with the help of a boozy rock musician on the slide. The Poker Face singer knows more than most how to take on the music industry and win. Gaga isn’t entirely new to screen acting: her CV includes (brief) appearances in Robert Rodriguez’s Machete Kills and Sin City: A Dame to Kill For as well as a recurring role on American Horror Story. All the same, she’s got several pairs of big shoes to fill: Janet Gaynor (the 1937 ASIB), Judy Garland (1954), and Barbra Streisand is another matter (1976). Yet from the moment we see Ally on the telephone in a toilet cubicle, screaming at a soon-to-be-ex lover, it’s clear she’s got the chops. Gaga’s star may well have been born already, but she’s sensational here. Alongside her all the way is Bradley Cooper, making his directorial debut with extreme confidence. He plays Jackson Maine, a rock ’n’ roll star who, when we first join him, is popping pills on stage before playing. After a chance encounter with Ally in a drag-queen bar, where she’s singing on stage, he’s captivated. “I don’t sing my own songs… I just don’t feel comfortable,” she says, but before long, she joins him on stage in a moment that’ll give you goosebumps. One of the film’s big selling points is its approach to the musical numbers. Real crowds, real venues, with no CGI in sight; the film even gives us Ally and Jackson playing on stage at Coachella and Glastonbury. Cooper – every bit as accomplished as Gaga in the musical sequences – injects the same doc-like realism into domestic centred on Ally’s relationship with her loving father (Andrew Dice Clay) and his cronies. As Ally and Jackson fall in love, they hit the touring circuit; before long, she’s being courted by slick record exec Rez (Rafi Gavron) to cut a debut album. Jackson, meanwhile, is on the wane. After falling out with his older brother (Sam Elliott), who is frequently there to pick him off the floor, his substance (ab)use worsens – a dependency that will ultimately be exposed in the most humiliating of ways. True, Cooper’s film could do with a tighter edit, especially in the second act, where it has a tendency to drag. But all told, A Star is Born is a big achievement: raw, romantic, tragic, and tumultuous. Like Jackson says to Ally, “having something to say” is what counts. Featuring original songs penned by Willie Nelson’s son, Lukas, this is one film that sings from the heart.